Ever wondered what lies in the vast wasteland south of Al Kharid? 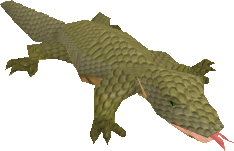 Well, it's the desolate Kharidian Desert, and it's a dangerous place, filled with bandits, crocodiles and vultures. 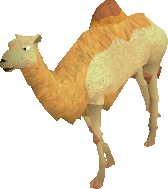 However, the Kharidian Desert offers good rewards to those who dare to breach it. In the Kharidian Desert, you can start many quests, fight some unusual monsters, and even play an Activity! 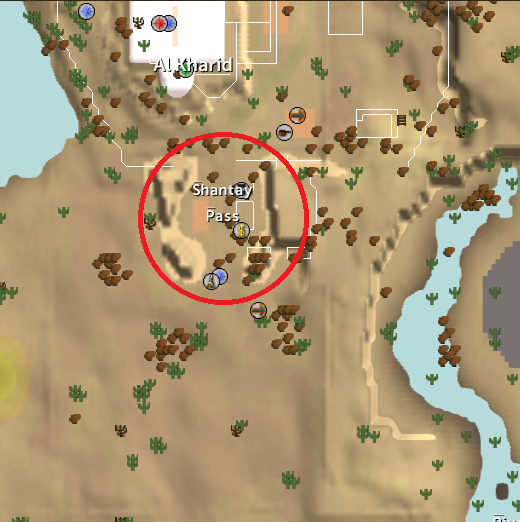 First, before you enter the Kharidian Desert, visit Shantay at Shantay Pass, south of Al Kharid. From Shantay's shop, you can buy most of the items that you'll ever need to stay safe in the desert. First, buy a Shantay Pass from its namesake, which will allow you to access the Desert. Next, buy a Desert Shirt, Desert Robe and Desert Boots. These robes will let you go longer without needing water. If you've completed the Rogue Trader Activity, the desert clothes that you can buy at the end will also serve as part of your SDTG (Standard Desert Traveling Gear). Even if you reflect the sun's heat, you'll still need a water source. 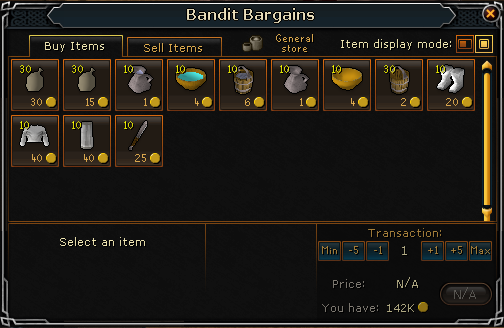 From Shantay, you can buy a Waterskin (4) for the small sum of 32 gp. Before setting out into the desert, make sure that you have 2-5 Waterskins. At this point, you will have a complete set of SDTG. Your character will automatically drink from the Waterskin when he/she is thirsty and it will become a Waterskin (3). To fill it up again, simply use the Waterskin with a sink, or a bucket or jug filled with water. 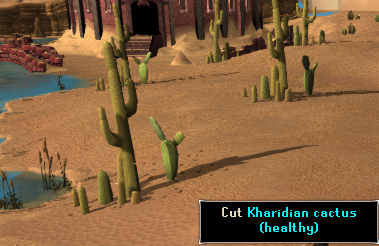 Additionally, by cutting a healthy Kharidian cactus with a knife, you will give your Waterskin another dose of water. However, relying on cacti is risky; you will sometimes fail to cut the cactus and not receive any water from it. In the desert, all water in open containers (e.g., buckets, bowls) will evaporate. Now that you know the risks of the Desert, it's time for the good parts. Of course, not all of the Kharidian Desert is, well, desert. Many cities have sprung up at oases, where drinking from your Waterskin is not necessary. The largest of these cities is Pollnivneach, on the bank of the River Elid. Pollnivneach boasts a Kebab shop, the Smoke Dungeon , and plays a major role in The Feud quest. 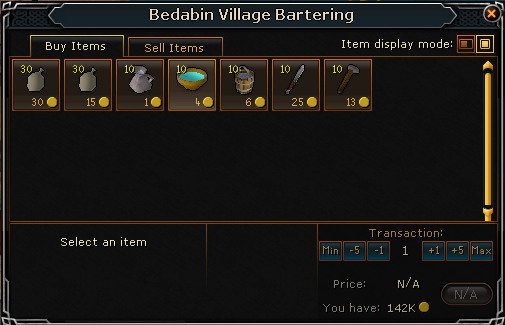 If you need to restock your supplies, you can buy Waterskins from the town General Store. Another important desert city is Nardah, southeast of Pollnivneach. This city's main attraction is for its role in the Spirits of the Elid quest. 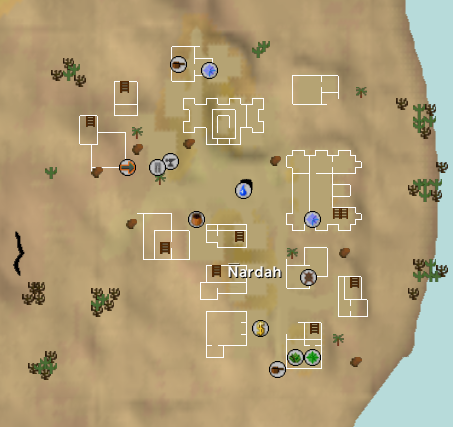 There's also a bank in Nardah, which is handy, given that it's the only bank in the Kharidian Desert. Additionally, if you don't have a high enough Herblore level, you can have all your unidentified herbs identified for the fee of 200 coins per herb, and you can buy pieces of black and runite armor from the armor shop there. 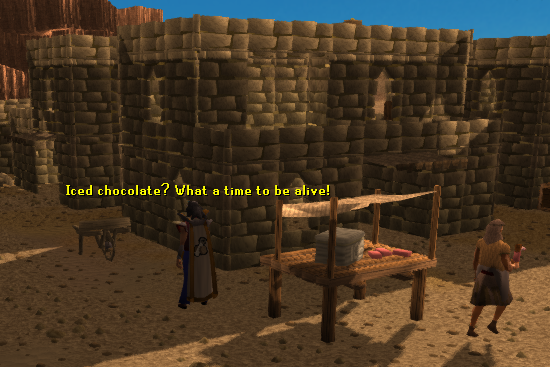 Before you leave Nardah, be sure to stop in and sample Rokuh's Runescape-famous Chocolate Ices! To the southwest of Shantay Pass and northwest of Pollnivneach is the Bedabin Camp. This city plays a major part in The Tourist Trap quest. Additionally, the Bedabin Camp provides a place for you to restock on your water supplies, as by trading with the Bedabin Nomads, you can buy Waterskins, Knives and more. Finally, the last major city in the Kharidian Desert is Sophanem. This interesting city, although in the middle of nowhere, is the home of the Pyramid Plunder Activity and is the start location for the quest Contact and plays a major part in Icthlarin's Little Helper quest. There are many other things to do in the Kharidian Desert that aren't in cities, per se. Southwest of Shantay Pass is the Kalphite Lair, home of the level 333 Kalphite Queen. 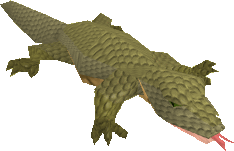 Along with the Queen, there are dozens of lower-level Kalphites roaming the dungeon, whom you can easily use for Slayer tasks. This dungeon also contains the only respawn of Potato Cactus in the game, used in making potions for Herblore. Directly south of Shantay Pass, the Desert Mining Camp is a good spot for high level miners. This mine boasts six adamantite rocks and six mithril rocks. To access the camp, you need to have completed The Tourist Trap quest. Southwest of the Desert Mining Camp is the Desert Bandit Camp. This city provides one of the best training areas in Runescape, if you know how to do it. For more information about this method, check out the Desert Bandit Camp city guide. In addition to training, you can buy a frosty Bandit's Brew for 650 coins, which temporarily raises your Thieving by one level. Finally, the Bandit Camp has a General Store that allows you to restock on desert supplies. Another desert mining spot is southwest of the Desert Mining Camp, at the Quarry. Here, there are 20+ sandstone and granite rocks, which provide excellent experience if you like to powermine. The Quarry plays a role in the Enakhra's Lament quest, and the quest's start point, Lazim, stands north of the Quarry. Directly east of the Quarry is the Pyramid. The Pyramid's sole function is as part of the Desert Treasure quest. Azzandra, the final character in Desert Treasure, can be found here. 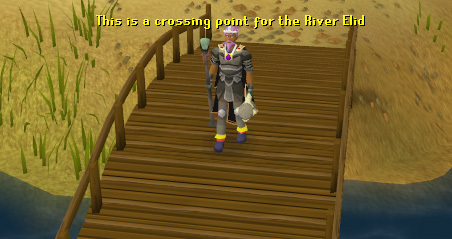 At this point, we must cross the River Elid on our trip through the Kharidian Desert. There are only two bridges on the River Elid. One is directly east of the Pyramid and the other is southeast of Shantay Pass. Once you cross the bridge east of the Pyramid, the next major landmark is the Agility Pyramid Activity, located southeast of the bridge. You need 30 Agility to play, but that work pays off. You get a good Agility Experience boost when you finish it. Be sure to bring food, some Agility Potions and the rest Waterskins if you want to stay camped there. There are many obstacles to dodge, and some of them get frustrating. Be sure to be wearing Desert Robes when you do this, to conserve your waterskins. 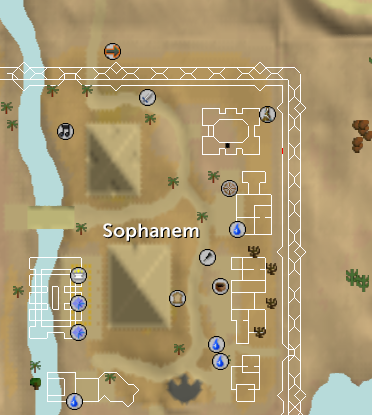 To put the Agility Pyramid in geographical perspective, southwest of the Agility Pyramid are the twin cities of Sophanem and Menaphos, and northeast of the Agility Pyramid is the city of Nardah. A long way north of Nardah is the next attraction: a Hunter area. Here, with level 13 Hunter, you can catch Desert Devils. They drop bones, raw beast meat, and desert devil fur, the last of which is used to make Camo-Gear. Time for the last Kharidian Desert attraction! It's the Ruins of Uzer, the location of The Golem quest. Other than that, there's nothing to do, except for a small clay mine to the northwest. The best way to get from city to city in the Kharidian Desert is by Magic Carpet, as it's much faster than walking. A Magic Carpet station icon is marked by the ( ) symbol on your map. 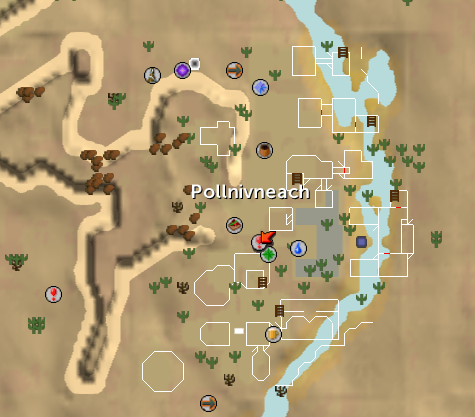 The cities/attractions that are accessible by Magic Carpet are: Pollnivneach, Sophanem, Menaphos, the Bedabin Camp, the Ruins of Uzer, and Shantay Pass. For some of these cities, you need to complete a quest to before being able to take a Magic Carpet to these cities. Magic Carpet rides are a little expensive: 200 coins per trip. However, the price is reduced to 100 coins if you have a Ring of Charos (a). The price of a carpet ride is further reduced, to 75 gp, if you've completed the Rogue Trader Activity. For more information about Magic Carpets, check out the excellent Magic Carpets guide. Talk to him to begin the quest Desert Treasure. Talk to him to start the quest Spirits of the Elid. Talk to him to begin the quest The Golem. Speak to her to begin the quest The Tourist Trap. Talk to him to start the quest Enakhra's Lament. Speak to him to start the quest Icthlarin's Little Helper.